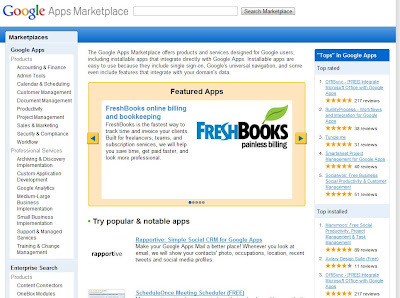 Google's marketplace is centered around Google Apps (email, documents, contacts, etc), while Intuit's is centered around their very popular accounting software. Both offer developers single sign-on mechanism, some access to their own applications for integration purposes, billing (actually Google doesn't yet, but will soon) . Both offer developers to host their applications and provide different levels of development tools. Intuit even goes as far as to offer file storage ala Amazon's S3, which Google doesn't offer yet. One thing you notice if you look closer is that 3rd party SaaS apps are not yet deeply integrating with either service. Most implement single sign-on. Some will make it easy to import / export data to/from the app they are integrating with; but lacking the level of integration that would be considered significant. Perhaps this is just the beginning and the integration will get better from here; but something tells me that these apps will try to keep a neutral stance and avoid putting the hard work into deep integrations. Bottom line? Integrated apps are better than non-integrated apps. 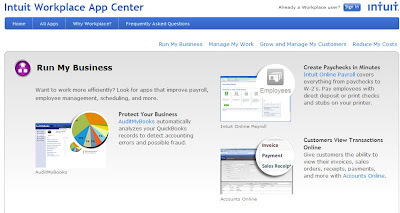 :) You'll have to choose which to start with Intuit or Google Apps, and this can be a bit of a hassle..
All in all, I'm excited to be watching these developments as they can mean significant improvement to ease-of-use and productivity. Happy SaaS'ing! Google would acquire a sales culture. This is what’s most important to us. Along with leadership, culture is the single most important factor in a company’s success. Everything else derives from it. Google has an engineering culture, which is great, and it has plenty of salespeople, most of whom we’re sure are great, but having great salespeople is not the same as having a great sales culture. Google’s advertising products basically sell themselves, they’re so effective. This does not at all create the same culture as having to fight tooth and nail to bring the conservative, risk-averse IT departments of large corporations on board with a new, innovative product. Benioff is a technology and product visionary, but he’s also a relentless salesman down to the last fiber of his body, who has built a fantastic, sales-oriented culture at Salesforce. Google needs to add that scrappy, hungry sales mindset into its DNA. It could be argued that Microsoft’s tremendous past success is due to the fact that it was able to marry two often incompatible cultures: a great engineering culture and a great sales culture (each embodied by Microsoft’s historic leaders, Bill Gates and Steve Ballmer), which allowed it not only to churn out proficient products faster than anyone else but to pummel its competitors in the marketplace with superior salesmanship. Google needs to take a page from the Microsoft playbook. 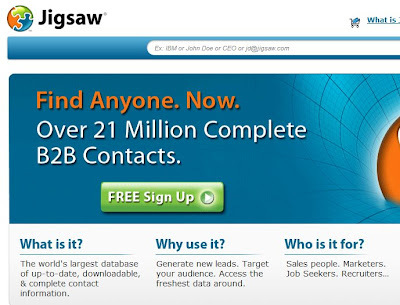 In an interesting move, Salesforce announced its intention to acquire Jigsaw - an aggregator of business lead data. 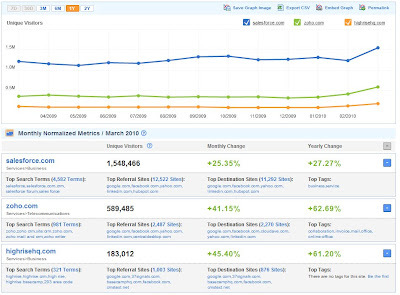 As you can see from the graph, Salesforce is enjoying a nice lead, but Zoho CRM is not too far behind. 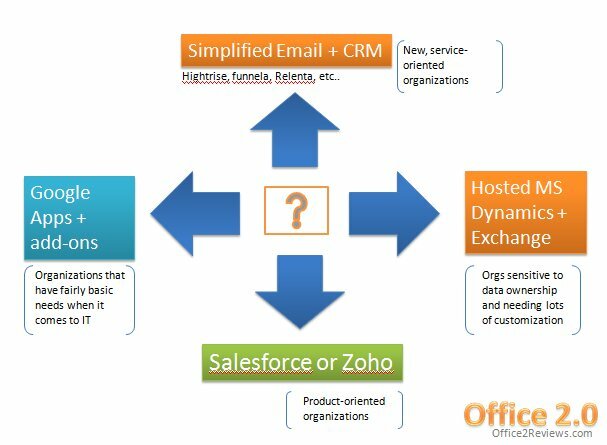 Yes, today they are catering to different audiences - Salesforce is a choice for medium to large enterprises that have decided to take a SaaS plunge, while Zoho is more popular with small business crowd; but we all know how this story can end.. Think what you have to go through to try out a collaboration application you've found that you think might work for your office.. Mac or PC, doesn't matter. You have to install it yourself, check that it works (while praying that it doesn't mess up your settings or interfere with other programs). You have to convince others to install it so you can try it together (while praying that it doesn't mess up their computers). Client software needs a server somewhere to exchange information.. If the application/plug-in doesn't get much use, you will ask everyone to uninstall it, and good luck trying another one - you'll have to go through the process all over again. Now, compare that with what happens in the Google Apps world.. You just add the application you like to your domain.. it connects to all other Google apps services that it has business communicating with (authentication, email, calendar, docs, etc..) Voila! You and your office are ready to go.. No additional software to install, no databases to worry about.. And if you don't like it - no problem! Just uninstall it - it uninstalls (unlinks rather) for everyone. 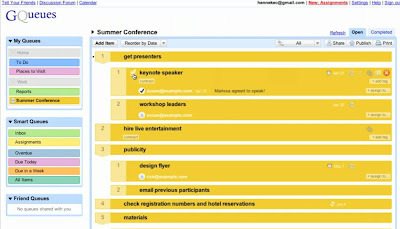 One such example is Gqueues - it's a nice task manager that's well integrated into Google apps environment. It's connected to calendars, it supports task assignments, sharing over Google protocols, etc.. So there you go - Google apps is not just about cheaper online office apps - it's about a much better platform and an eco-system! !